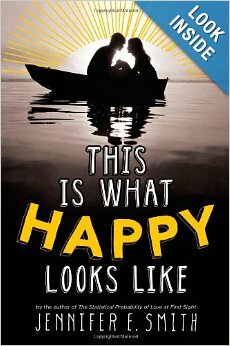 This is What Happy Looks Like by Jennifer E. Smith is a cute coming-of-age book…sort of. Not quite as awesome as her first novel, The Statistical Probability of Love at First Sight, but still an enjoyable read. Perchance, two teenagers start swapping emails due to a small typo in the “send to” email address. Knowing nothing about the other originally, other than the fact that they both have a pet and have read Charlotte’s Web, the witty banter flows much too easily. After a smidge of investigating from context clues gathered, the original sender discovers where his Internet Pen Pal lives. And because he just so happens to be no other than Graham Larkin (teen celebrity heartthrob), he pulls some strings and gets the production of his newest movie moved to small town Main. Upon discovering that her mystery guy friend is insanely famous, Ellie wasn’t quite sure how to handle the news. Not one drawn to spotlight and drama, Ellie pulls away. But she can’t help how Graham makes her feel…the real Graham (the boy she spent several hours a day writing to), not Graham Larkin the movie star. Figuring out what we think is important in life and what is truly important can be a hard truth to wrap your head around. A lot of the time, overcoming our own fear and learning to lower our personal self-preserving safety net is a difficult feat, indeed. A pretty cute coming-of-age novel, with some pretty deep self-examination thrown in (not to mention coming to the realization that the whole world doesn’t revolve around you, no matter who you are, and you have absolutely no way of knowing exactly what other people are thinking, unless you happen to be telepathic), I would say This is What Happy Looks Like was worth the read. Three out of five stars!